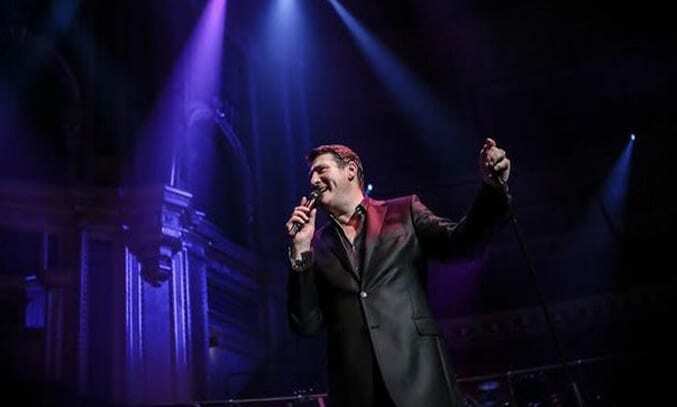 More than three decades after Spandau Ballet topped the charts, Tony Hadley is back on the road for a nationwide solo tour with a full orchestra… and boy does he sound good. Hadley first shot to fame in the 1980s as the lead singer of pop/romantic band Spandau Ballet. The group sold more than 20 million albums in their heyday, with eight top ten hit singles to their name including: Chant No.1 (I Don’t Need This Pressure On), Instinction, Lifeline, Gold, Only When You Leave and Through The Barricades. For the past 20 years, Hadley has been touring as a solo artist in his own right, with four solo studio albums to his name. But if you thought the 80s were dead, think again. Following his incredible sold out shows last autumn, Hadley demonstrated that he still has what it takes to entertain an audience as he belted out an array of hits at Manchester’s Lowry Theatre. Hadley’s two hour set is spilt into two halves, the first packed with classic covers and new material from Hadley’s new solo album, the second devoted entirely to Spandau Ballet hits. The evening opens with New York Minute, a classic track by rock legends The Eagles before moving into a brilliant version of David Bowie’s Life on Mars. Hadley’s rich and distinctive vocals have lost none of its power as he demonstrates with a thumping rendition of The Killers’ Somebody Told Me. The first half closes to a superb version of Simon and Garfunkel’s Bridge Over Troubled Water, a number Hadley first performed in a tribute concert for Elvis. The second half is devoted to Spandau Ballet hits, kicking off with To Cut a Long Story Short, before moving swiftly into Highly Strung, Only When You Leave and other classic tracks such as Through The Barricades and True. The audience is also treated to an exclusive live performance of Soul Boys, a new song written for Spandau Ballet’s greatest hits album and to mark the release of the new Soul Boys of the Western World documentary. The highlight of the evening is Musclebound, the epic Spandau number which is completely transformed by the orchestral arrangement. The closing number, Gold, is also equally excellent with the 40-piece Southbank Sinfonia Orchestra and Hadley’s 10-strong backing band giving the famous number the power and grandeur it deserves. Flawless, powerful and incredibly entertaining, Hadley’s powerful and distinctive vocals are on fine form, giving one of his best performances to date. Add an Orchestra into the mix and the Spandau hits we know and love so well, sound even better.